When you first visit this lower Warrior River reservoir, you will notice two rivers joining about one navigable mile above Demopolis city launch. This is the junction of the Warrior River and the Tombigbee River. There is a lot of wood and weed cover, found along creeks and pockets situated on these two rivers. Bedding bass will take up residence this Spring, along both of these major south Alabama tributaries. A feature you don’t see on many other Alabama reservoirs is the presence of cypress trees. These aquatic-growing trees play a significant role in these lower Alabama waters during Spring. During the prespawn period, isolated, mid-creek cypress trees, have many bass gather around their huge root jams, before moving shallow to spawn. Backwater cypress trees often grow in 1-3 feet of water, and many bass use these wooden cover as hideouts or ambush spots, when feeding. They can also have several bass beds around them from April through May. Keep this in mind, when fishing the scenic, cypress filled backwaters of the Warrior River, in Demopolis this Spring. Before the prespawn bass of March make their move towards the shallow spawning backwaters, many will gather in the mouths of creeks, pockets, small cuts and in shallow, backwater flats. A lot of these bass have been in deep water all Winter, while others have already foraged shallow to feed during winter warming trends. Further urges to feed, along with the urge to find a mate to exercise the rituals of spawning, will lead these male and female bass to gather along drop-offs, main river and creek mouth junctions and the edge of flats. With cold fronts, many bass will be found here until conditions improve. With a sudden rise in the water temperature (usually after a week or two warming trend) bass will head back up the creeks. Most bass of both species will gather along shallow-to-deep junctions, before moving shallow to spawn. 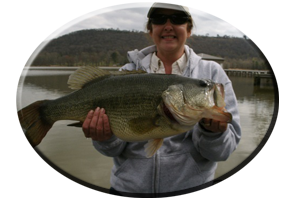 This is the time to present your lures around first and secondary main lake points and creek points, along the edge of flats that drop into deep water, all around islands, on submerged humps, bars and underwater ridges. Also along other bottom irregularities, isolated cover and generally, anything out of the ordinary, that will attract a big, dominating bass. Its also the time to start looking for new green weeds. When found, you can rest assured bass are nearby. These prespawners will hit a lot of lures, generally fished anywhere from 1-10 feet of water, all throughout the entire prespawn-to-post spawn period. However, not all bass are shallow during the prespawn period. Always try relatively deep water in March (10-15 feet), with lures such as deep-diving crankbaits, rattling lipless lures, hard-bodied suspending model jerkbaits and jig combos. Worms, lizards, crayfish imitations of all sizes, and both Texas and Carolina-rigged plastics, jigging spoons, slow-rolling (or dropping) heavy spinnerbaits, will all entice strikes from these slow, slightly lethargic bass. With several warm nights and a full moon, some bass will bed in late March. Fishing shallower each day is the key, as this month progresses, especially with a warming trend and slightly stained or off-colored water conditions. Some Big bass will hit topwater lures to, that is if water temperatures are on the rise, with an approaching front. 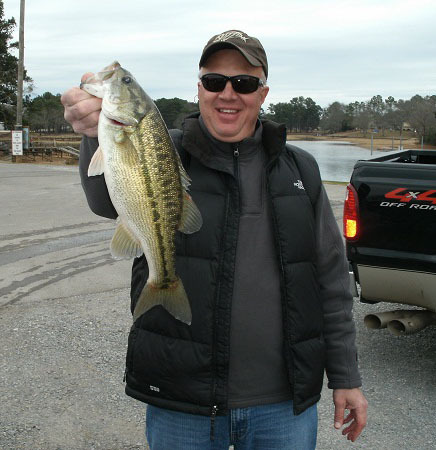 Use heavy line, sharp hooks and stout equipment, when fishing Demopolis Lake during March. Some of the year’s biggest bass are taken during this month. With stable water levels and water temperatures in the low-70′s, the majority of male and female bass will bed in early April. If conditions are not so ideal, many bass will stall, as the rituals of bedding slow, until the mid-to-late April period. Regardless, all bass must bed this month and some stragglers can be found bedding on into late May. This means a lot of bass are in 1-3 feet of water, in some very small backwater pockets. Finding the right spot in April involves looking for baitfish activity, observing feeding fish activity, along with fishing in areas with lightly stained water color. Finding the warmest water available can mean finding the most active bass. 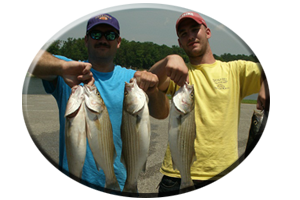 Targeting a hard or sandy bottom is also very important. Green weeds, stumps, laying logs and brush, and plenty of wood cover, complete this recipe for the perfect spawning grounds. With very little rain, many of these areas will be lightly stained or have a tannic, light brown, water clarity. Keep in mind, bedding bass are easily spooked bass, and a silent approach, with long cast’s, are often needed to fool some big bass into striking. You do not want them to detect your presence. 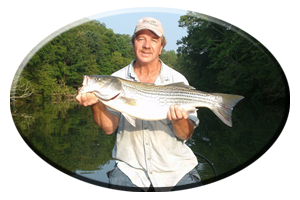 Polarized sunglasses are a must, to avoid sunlight glare on the water and aid an angler in spotting beds or cruising fish. If spring rains muddy up these shallow creek backwaters, seek out the lightly stained or clearest spawning grounds available. Either that, or fish very shallow with slow moving lures that display bright color combinations, models that emit sound, and/or lures that emit flash or vibration. This especially holds true if fishing during very muddy water conditions or in off-colored water conditions. Read on, for more on fishing aquatic weeds, using various lures and topwater tips, for May on Demopolis Lake. I failed to mention weeds and topwater lures in April tips, but these May tips can apply to that same month. By May, the many varieties of aquatic weeds in Demopolis are found all along the Warrior River and Tombigbee River. Most weeds will be in full bloom. Bass will inhibit these new green, oxygen-rich weeds during pre-spawn times, during the spawn and especially when weeds are the greenest, during post-spawn conditions. Topwater lures are annihilated during the month of May, when fished along weed edges or when ran through the weeds. Fishing at dawn, mid morning to the midday period, or even in late evenings, for these kamikaze bass, can be very exciting. This topwater technique, involves the use of dozens of lures, and the lure choice can vary among each angler. This can show a fantastic day in these scenic backwoods in south Alabama, fishing for largemouth bass and spotted bass species. It will provide a lasting memory for years to come. * Best Lures for Demopolis? Floating worms are good lures for fishing right up in the weeds. They are also good (along with soft jerkbaits) around the variety of wood cover including cypress trees (previously mentioned) and around brush, laying logs, laydowns and stumps. Many frogs and small rodents roam these lower Alabama backwaters and often stumble into the water. 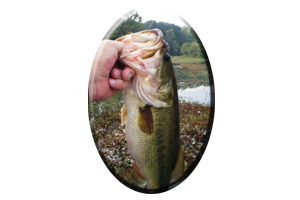 Lures such as, Scumfrog and Bassin’ Rat lures, mimic these creatures and bring explosive strikes in and around the weeds, brush and wood cover. Buzzbaits cover a lot of water fast, and get the attention of bed-protecting male bass and some mighty hungry female bass, hanging nearby. One of my favorite lures is a noisy, clacker-type buzzbait. Always include trailer hooks for short strikes, adorn with quality hardware and very sharp Gamakatsu hooks. Spinnerbaits are great lures during May, whether buzzed near the top, making a wake, utilizing a slow retrieve, or dropped, alongside wood cover, weed cover or down a line of rocks. * Places like rip-rap rocks lining causeways, culverts, around bridges and dams are great spots featuring constantly warming waters, good for fishing with spinnerbaits. These flashing, vibrating lures are popular throughout the south and a proven favorite among Alabama’s tournament winners. Always use strong line and stout equipment, when fishing these spinnerbaits and other Big Bass attracting lures on Demopolis Lake during the spring season. Some lures can be worked in one spot and aggravate bass into striking as they come off the beds. Pradco’s Zara Super Spook is one. When expertly walked around Cyprus trees, down laying logs and trees, around or near any stump or brush pile or along weed edges…they always produce some very vicious strikes. These Big lures always generate a few blow-ups, usually from big, aggravated bass. Use heavy 20 pound test line. Other tantalizing topwaters such as, Baby spooks or Baby Torpedoes, Crazy Shads, Excalibur’s Spittin’ Image, Spro’s popping type lures and prop baits, and Pradco’s Pop-R’s, all fall in this category. Each lure can be slowly jerked or left in one spot, for as long as you and the bass can stand it. 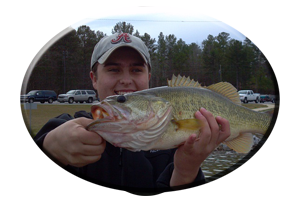 Strong line and stout equipment, are recommended for tackling some monster bass, while fishing in the scenic backwaters of Demopolis Lake.